I haven’t quite figured out if people here in the UK just have a really poor understanding of race and racism or if they are deliberately being ignorant. I do believe it is a sad combination of the two, even though black people have been here since the beginning of time (don’t let these colonisers fool you), many really just do not understand the social construct that is race, nor what racism actually is. 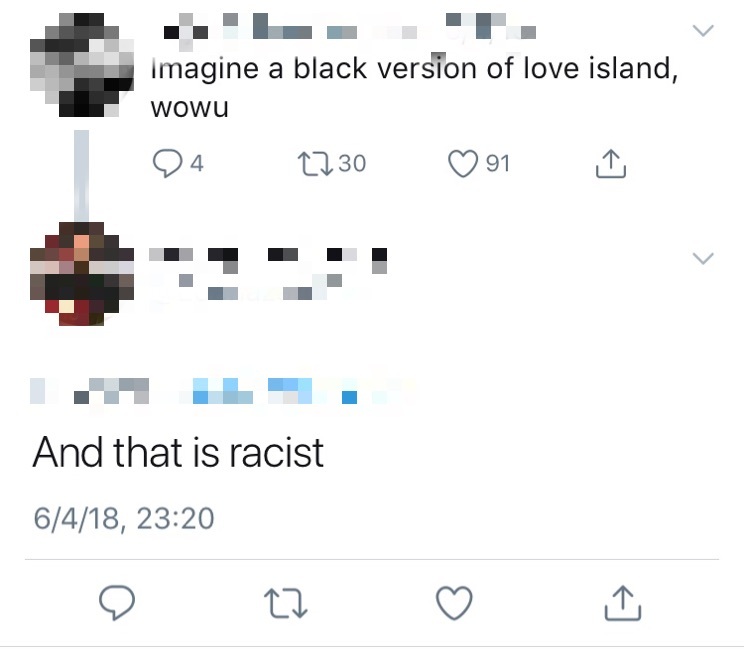 I mean come on, would these twitter keyboard warriors really call a black woman a racist for speaking about the lack of black people on the popular TV show Love Island if they actually knew what racism is? Due to the years and years of conditioning we have been taught that it is pretty much impossible for anyone darker than a pearl to be superior. Many believe this to be true and in way too many cases, people believe it is completely rational to have a dominating race. Incorrect and hateful ideals that have been taught to us for generations and generations. Now being past off as ancient history and we are now being told to believe that we have far passed the days where the majority believe that white is right. Unsurprisingly this is not true, racism in this country has manifested into something really insidious. The tweet I was referring to in the first part of this post. Black people did not just wake up and decide to incorporate self hate into their lives. Black people have had to unlearn both the direct and indirect messages of anti-blackness from several communities, including our own. Because the UK pride themselves on being better than everyone else, they refuse to accept that racism is still an issue in this Country. That would actually mean they would have to address way too many injustices. It is so damaging to constantly fight for our people in a place that dismisses anything you say as playing victims, like it’s some type of game. What do we gain from playing victims? I have yet to receive anything worth celebrating from the sympathy of other, unless I am missing something. Is there a certain amount of times I have to call out racism in order to access the secret code for the pot of reparations the government is hiding only for those die hard Activists? I did not create this post to bash white people, I wanted to voice my concern. I don’t know it all, but I also do not have mental energy to go around schoolin’ every white person who calls black person racist for speaking on the lack of diversity. Can you believe we are still having these discussions on diversity? At this point I am taking it as you simply do not care about anyone who is not straight, white, able-bodied or slim, and in that case I refuse to waste my breath on it. Ignoring the issue, acting like black people are making up issues solves nothing. Racism does not disappear because black people stop speaking about it nor does going around saying you do not see colour. Speaking about our struggles and sharing what we have to do to create the shift we want to see is how the conversation about race ends. Educate yourself. If you do not want to put that privilege to good use than kindly move to the side so we can get on with the important stuff, cheers! Previous Are UK Natural Hair Subscription Boxes Worth It? Next Blog Goals: Will I Ever Be A Full Time Blogger?